I took a 20-hour LDC Midway Pass Course with Kate's LDC driving school following 23 hours with another LDC instructor, Cath Crowther. I would recommend Kate to anyone as she is very friendly and supportive and helped with anything I struggled with. The LD System is great at explaining in detail every aspect of driving, alongside the workbook which describes every part of the lessons I had. I found the whole experience very informative, and it prepared me for the standard of driving that the examiner expects. Overall, it has been a brilliant experience and I am so pleased to have passed! 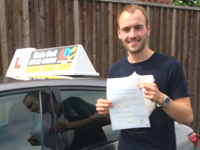 I'm a driving instructor in Holmfirth, Honley, Brockholes, Thongsbridge, Meltham, Upperthong, Netherthong, Underbank, Scholes, Huddersfield, Newsome, Lockwood, Beaumont Park, South Crosland, Netherton, Crosland Moor, Marsh, Lindley, Edgerton, Paddock, Longwood, Outlane, Milnsbridge, Golcar, Linthwaite, Slaithwaite, Marsden, Almondbury, Waterloo, Kirkheaton, Dalton, Lepton, Grange Moor, Deighton, Birkby, Fartown, Brighouse, Clayton West, Skelmanthorpe, Scissett, Denby Dale, Cumberworth, Birdsedge, Shelley, Kirkburton, Shepley, Flockton and surrounding areas.